Major Pearl Block, Information Operations Officer with the UN Stabilization mission in the Democratic Republic of Congo (MONUSCO). “I’m very happy, I’m proud to have been recognized for the good that I’ve done in the DRC, and I’m very happy to be receiving this award, I’m ecstatic,” said Major Block, an Information Operations Officer with the UN Organization Stabilization Mission in the DRC (MONUSCO). During a ceremony at the UN Peacekeeping Defence Ministerial Conference, under way in Vancouver, Canada, Prime Minister Justin Trudeau and Under-Secretary-General for Peacekeeping Operations Jean-Pierre Lacroix presented Major Block with the UN Gender Military Advocate Award for her outstanding work on the frontlines. In an exclusive interview with UN News, Major Block talks about her work and the role women can play in making the UN more responsive and inclusive. AUDIO: Major Block shares the significance of receiving the United Nation’s Military Gender Advocate award. VIDEO: Major Block shares the significance of receiving the United Nation’s Military Gender Advocate award. “I’m very happy, I’m proud to have been recognized for the good that I’ve done in the DRC, and I’m very happy to be receiving this award, I’m ecstatic,” said Major Block, an Information Operations Officer with the UN Organization Stabilization Mission (MONUSCO). During a ceremony at the UN Peacekeeping Defence Ministerial Conference, under way in Vancouver, Canada, Prime Minister Justin Trudeau and Under-Secretary-General for Peacekeeping Operations Jean-Pierre Lacroix presented Major Block with the UN Gender Military Advocate Award, for her outstanding work on the frontlines. Serving from July 2016 to July 2017, Major Block developed the SMS (text messaging) campaign on conflict-related sexual violence to reach communities difficult to access. Based in Goma, Major Block interacted with Congolese women, girls, men and boys to better understand their concerns. She trained fellow staff officers and troops to be more aware of gender dynamics within the Mission, which led them to develop more inclusive community engagement projects as part of the Protection of Civilians strategy combating illegally armed groups in eastern DRC. “I knew I had to take action from the many conversations I had with women’s groups. 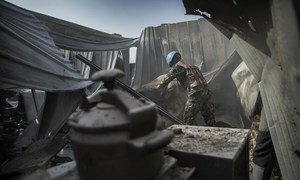 As a peacekeeper, and as a woman, I think we have much to contribute to making the UN more inclusive and in tune with the communities we serve,” she said. The UN Peacekeeping Defence Ministerial brings together defence ministers and other senior representatives from more than 80 countries and organizations to discuss the challenges facing UN Peacekeeping including the under-representation of women, and how to work together to find solutions.